I thought it would be fun to look back and do a little take on one table - four ways for Thanksgiving. Each Table arrangement and decor is all created with things I already owned or found hunting around my house and yard! 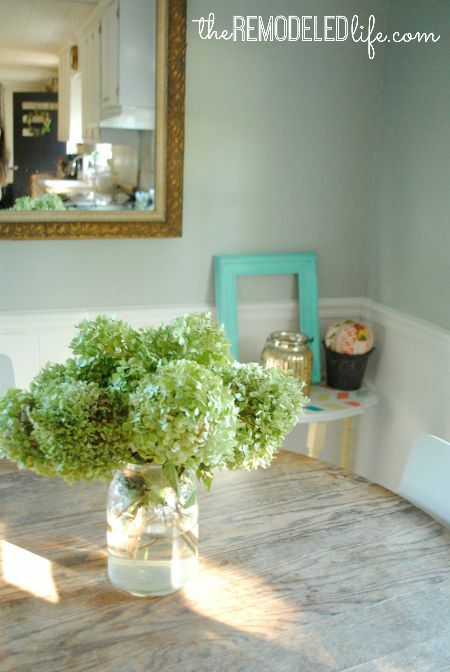 You can create simple and pretty table arrangements by using a little creativity. 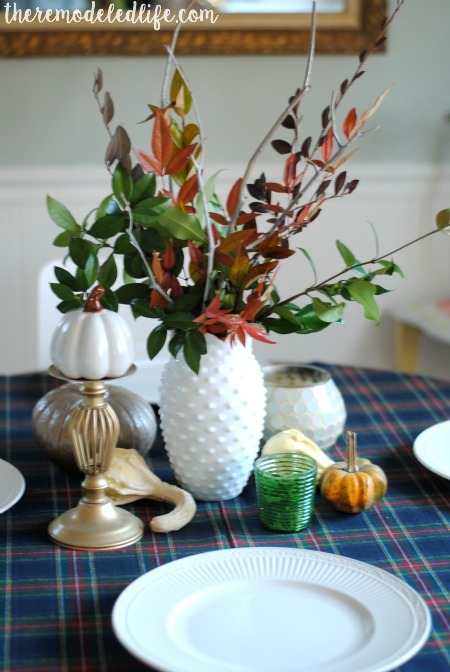 Table number one was created using a piece of cut plaid fabric I had on hand, gathering a few fall items I owned and creating a super simple table arrangement with items I literally picked from my yard. 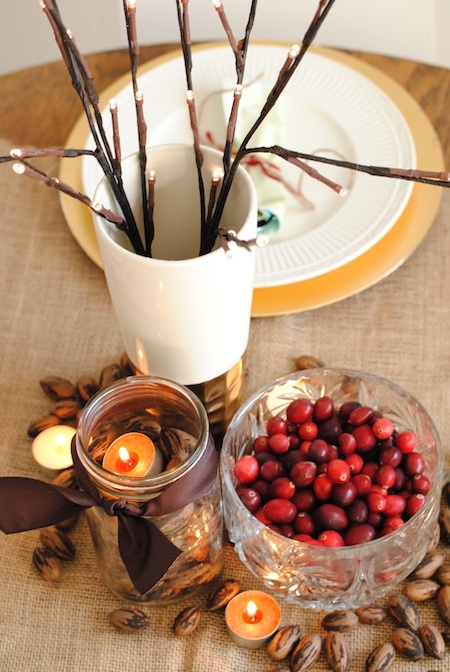 Branches, leaves and Twigs make a really pretty Thanksgiving table arrangement. 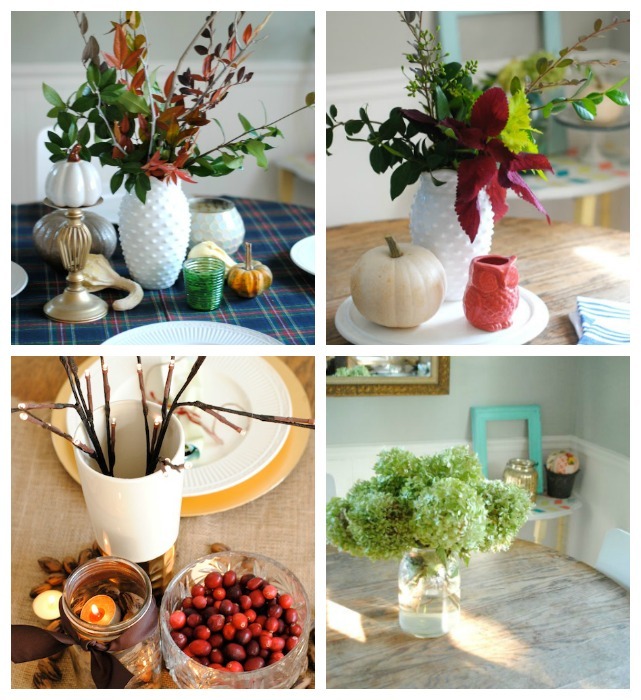 Next is the most recent Fall Table we have had; once again using clippings from the yard to create a table arrangement. Using a white vase really helps make the colors pop and to dress it up a ton. Not only do we have a plethora of branches, leaves and sticks to make arrangements with - we also have a pecan tree. So, why not use it. I love filling jars with things like pecans and acorns for fall. A simple burlap runner, a bowl of fresh cranberries and a few lighted twigs I owned finished it out. And ,the most simple arrangement of all, a mason jar over flowing with flowers from the garden. If you just can't seem to find anything in your yard to work then check out the grocery store selection. There are some really great flowers to be found there. 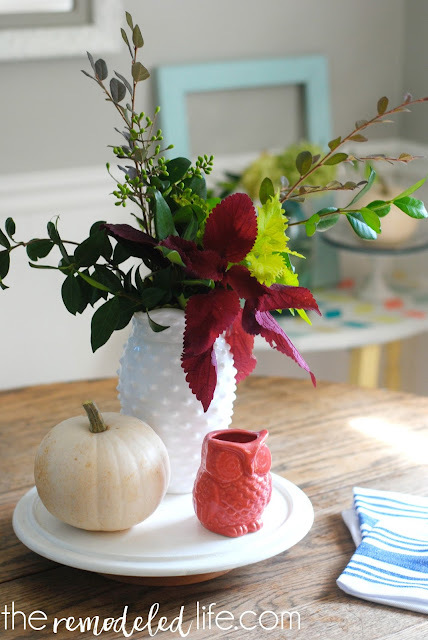 Trimming the ends to fit your vase is crucial for making those florals work. You guys, we have just a few days left to cherish and enjoy these fall colors and pretty Autumn decor. I'm squeezing in every last second until Christmas takes over our house...that's not to say the Christmas music hasn't already made an appearance (can't help it, I love it so much).